Sombre and majestic, four monstrous towers rise through a blue haze. The lights of the loading yard and the ancillary buildings shine through the evening gloom. 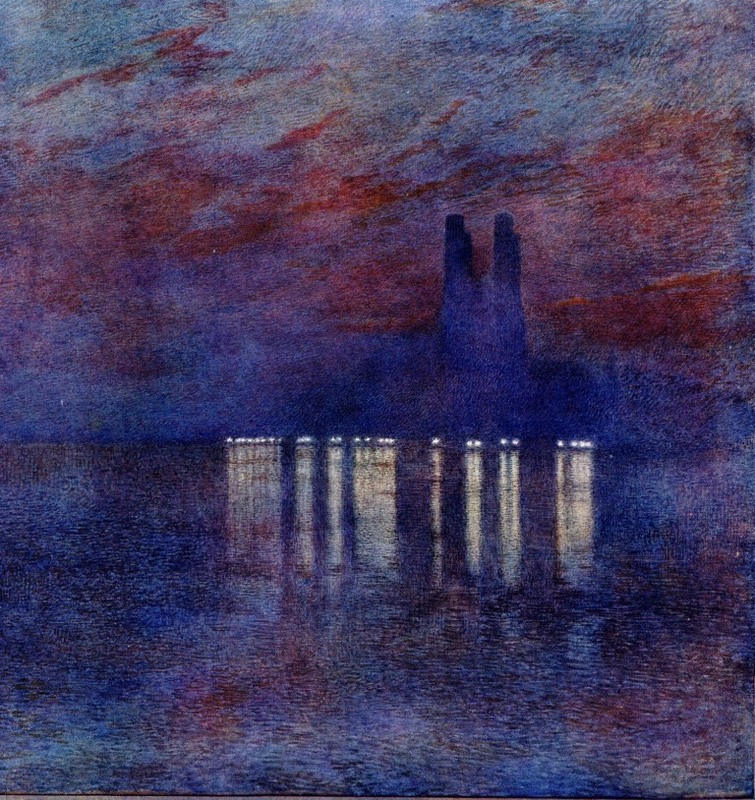 Those who had feared the forbidding structure later came to see it as a huge gothic folly looming over the dark waters. And the giant was beneficent, giving power to that network of tunnels and tracks which carried the people of the city from home to work and back again. Or that’s how it was seen by Londoners in the years before the Second World War. 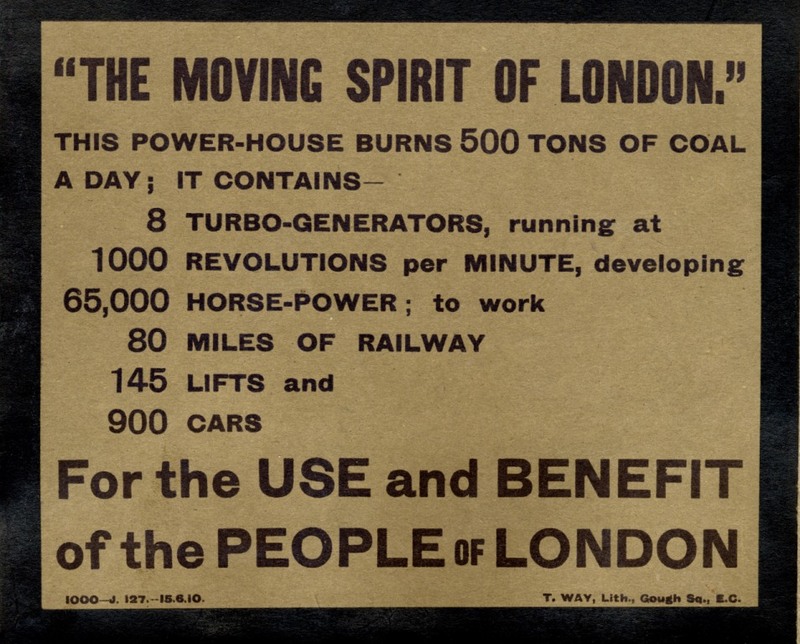 London Transport was proud of the great beast crouched by the river and the task it performed. Inside, operators attended to the creature’s need like priests attending to a captive deity in a temple. 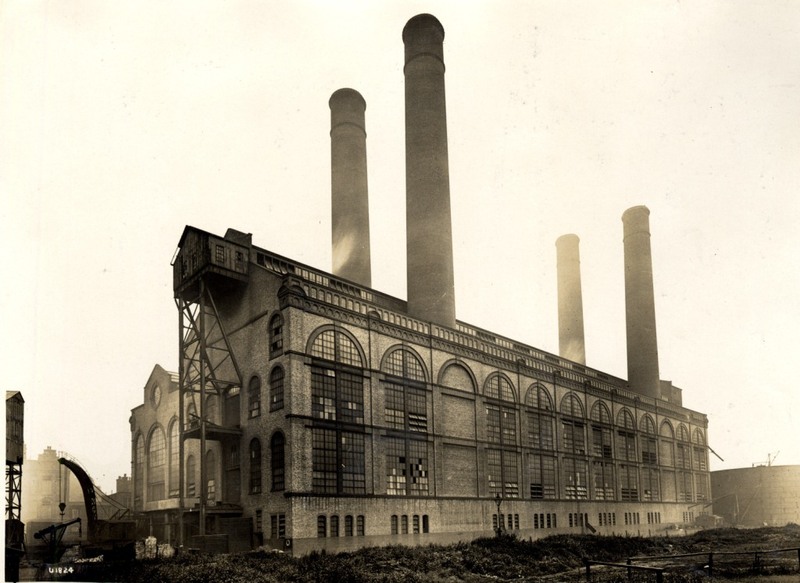 Lots Road Power Station or Power House as it was often called was one of those big engineering feats which belong to the early years of the 20th century such as the Titanic. Unlike the Titanic, the Power House never failed its people. This view from the river shows its cathedral-like windows. In daytime this was no dark tower. 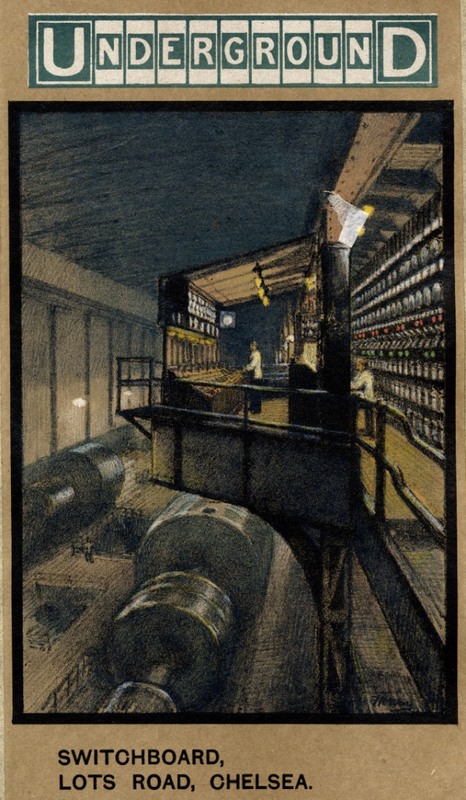 Light streamed in on the boilers and generators. 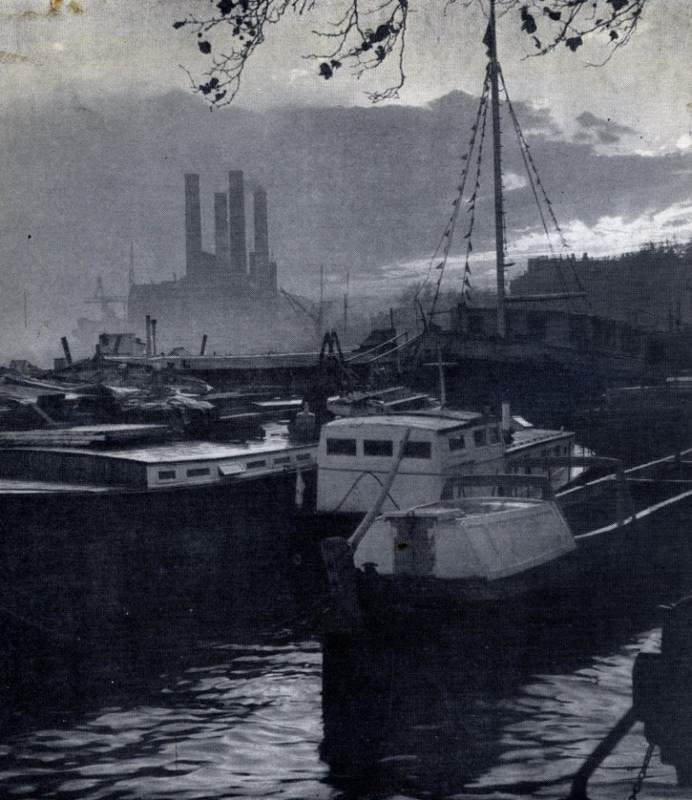 Before the Power Station came the skyline of Chelsea Reach looked quite different. 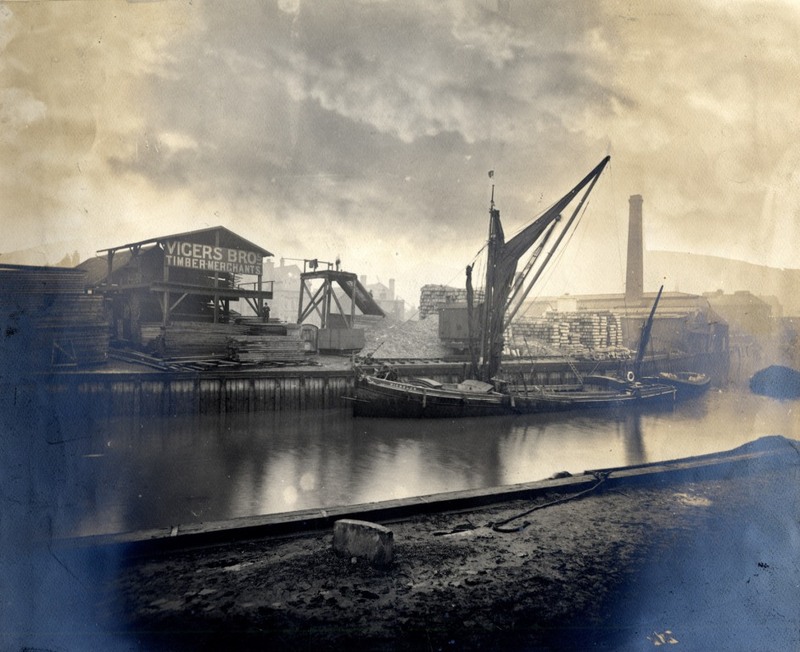 Lindsey Wharf in 1901. Chelsea Creek had served industry for years already. Salopian Wharf, the home of Vigers Brothers, timber merchants. 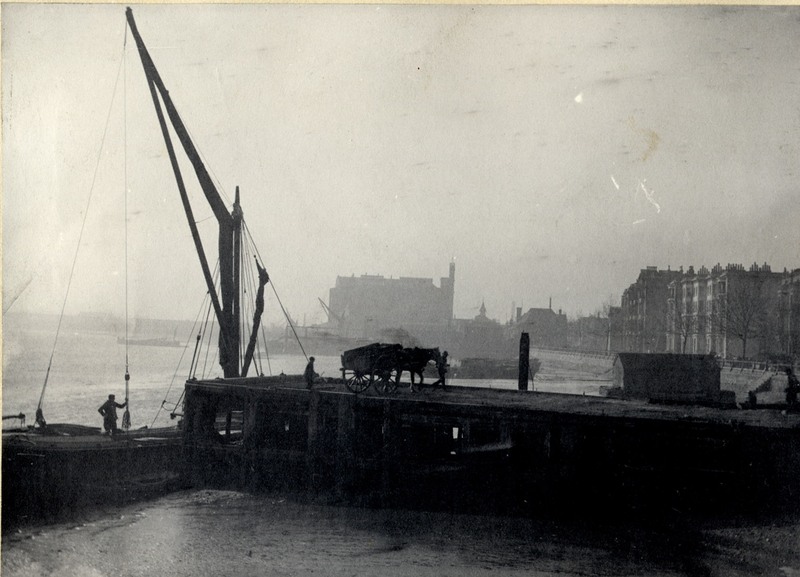 There were also docks for coal, stone, slate, lime and cement. There were Pipe Benders and Sanitary Lead Liners. 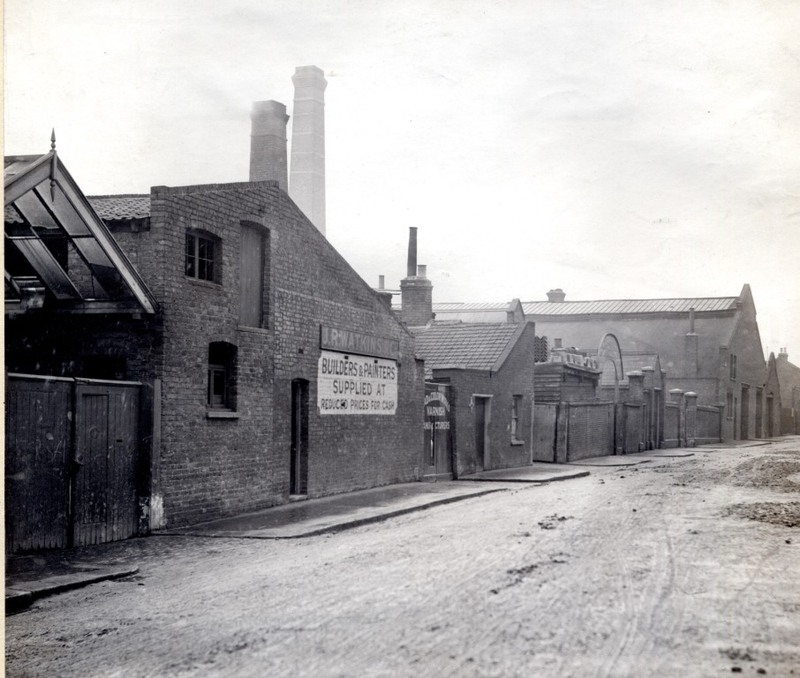 The General Omnibus Company had a granary and forage depot in Lots Road. J R Watkins and Co, colour manufacturers. 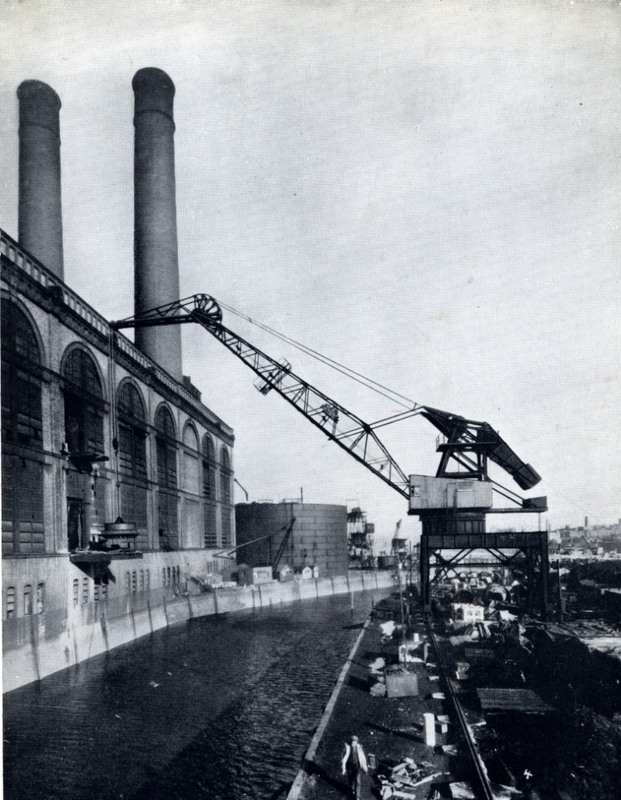 Both the Colour Works and Salopian Wharf were crushed under the Power House. An article in the Graphic for 1925 says “from this uncouth dragon on the Middlesex shore flows the power to move a city and light it. The gaiety and life of London are stored in its coils; for out of the strong comes forth sweetness, which radiates invisibly from west to east.” The uncouth dragon inspired artists. 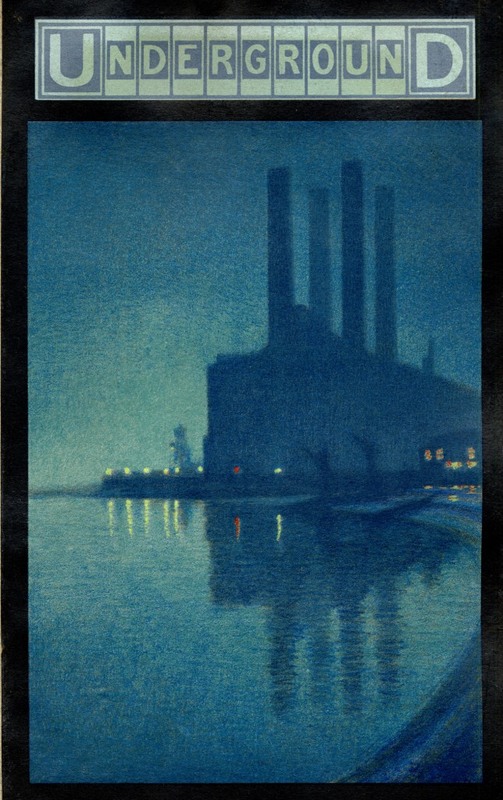 Nocturne by Luther Hooper (a detail of a wider view of the river). An atmospheric piece by Donald Maxwell. 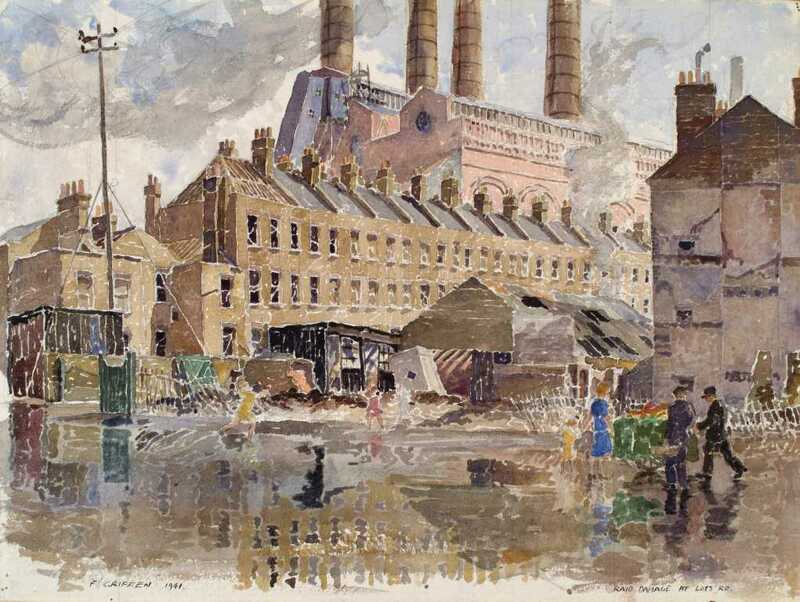 A 1941 watercolour by Francis Griffen. (We’ll have more of him another day) The bomb damage in the vicinity of the power station justifies pre-war fears that the power station would be a target for air raids in time of war. This picture from the late 1930s is captioned Bomb Magnets. Lots Road is in the background with Fulham Power Station in the foreground. Lots Road of course survived the war intact and remained part of the riverside scene. But let’s not go any further than 1951. I’ve told you all about the later years already (See The case of the missing chimneys in the list of posts on the right) Let’s leave the sleeping giant alone and remember the days when it was a triumph of engineering inspiring poster artists and bloggers alike. 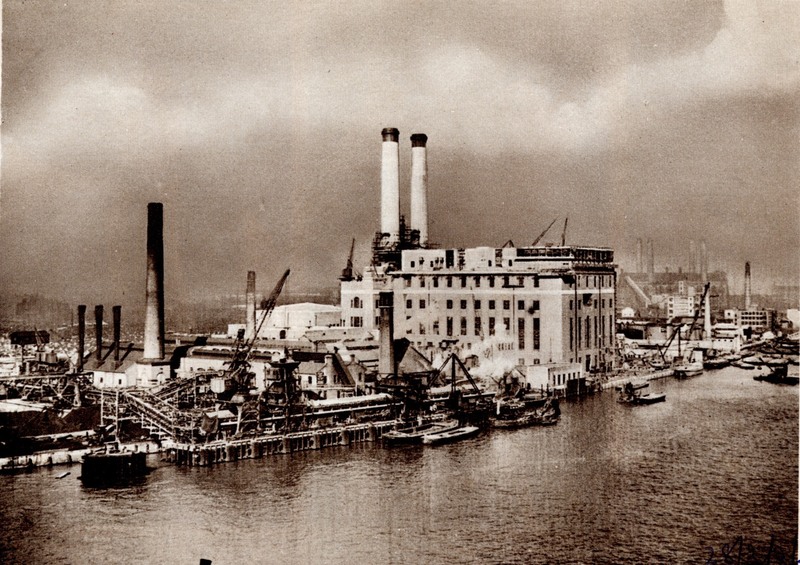 This entry was posted on Thursday, September 20th, 2012 at 12:51 am	and tagged with Chelsea, chelsea creek, Lots Road Power Station and posted in 20th Century, Chelsea. You can follow any responses to this entry through the RSS 2.0 feed. Fascinating post Dave! Do you happen to know if the two Underground poster were by Walter Spradbery? 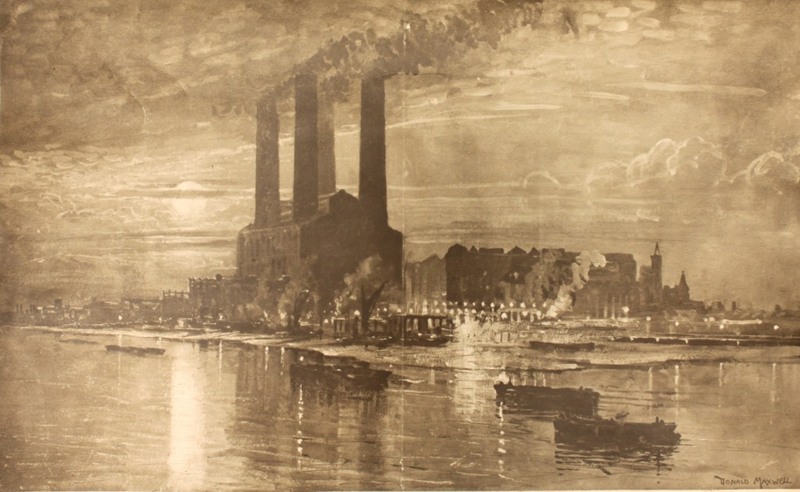 He produced the other well known LT poster “The Proud City” showing the power station from a different angle. Unfortunately the library scrapbook compilers of the early 20th century almost never told us where the pictures came from or who created them. The Proud City is certainly in the same style. I just finished reading John Le Carre’s first novel ‘Call of the Dead’ (1962) yesterday. The showdown in the last chapter involves a chase through Fulham onto Lots Road via the ‘Balloon’ pub, the villain escapes onto one of the houseboats. Steampunk News » Tesla 2012! Hi Dave, As a young man in 1962 I had a bedsit in Cedarne Rd but was looking for another one. I saw an ad for one in Lots Rd. Coming into it off Kings Rd there were tall terraced houses down the left hand side and a high brick wall down the right. The houses probably had not been painted since before WWI, and were very shabby. At the end of the road was of course the mighty power house.It was utterly depressing & I never went to the address. Instead I went to Nevern Sq Earls Court, where I met my future wife – & we’re still married! My grandfather was born in 1897 at 162 Lots Road. The house, I believe, is gone. Does anyone know if there have been any changes to the numbering of buildings on Lots Road since 1897? In other words, is 162 still where it was then? I’ve replied by email as it was a lengthy explanation. The images are all from the Local Studies collection. Email us at centrllocalenquiries@rbkc.gov.uk for details of how to obtain higher-res copies and repro charges.